If you didn’t know David and Sherry Rollins personally, you would be forgiven for thinking the couple had one of the largest extended families you’d ever seen. After all, nearly a dozen teenagers have come in and out of the Rollins household over the past decade, each staying in their home for just a handful of months before leaving, only to be followed shortly by yet another mysterious high-schooler. Host mom Sherry with their exchange student, Verena, in 2010. But these teens aren’t nieces and nephews, grandchildren or even distant cousins in need of a place to stay — they are foreign exchange students from places as far away as Asia and Europe. Some barely old enough to drive, these adventurous young strangers arrive in the United States to spend a semester or more completely immersed in American culture. That experience includes living in an American household throughout the duration of their stay — and, in the case of the Rollins, becoming an integral part of an American family. 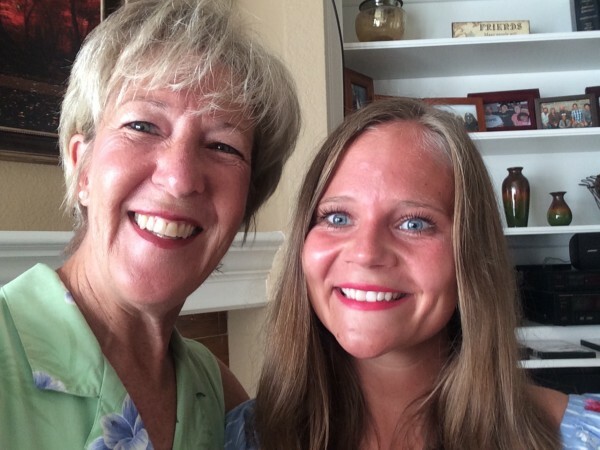 Though the Rollins began hosting exchange students only nine years ago, you could argue that their journey toward becoming a host family began as far back as Sherry’s time at university. During her junior year of college, Sherry lived and studied in France — and returned to the United States with an enormous appreciation for world travel and cultural immersion. So one morning nearly a decade ago, when the couple opened their local newspaper to find an ad inviting families in the area to host incoming foreign exchange students, it took no time at all for the couple to make up their minds. 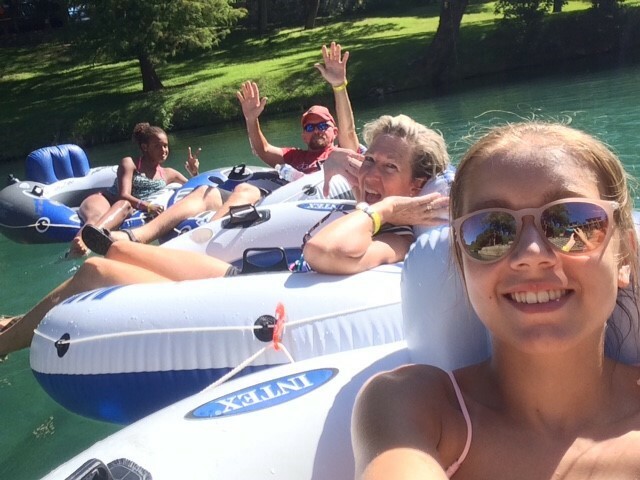 David and Sherry Rollins with their granddaughter and student Louisa tubing the Comal River in 2016. To date, the Rollins have hosted 12 foreign exchange students over the span of just nine years. Their students have come from countries as culturally and geographically diverse as South Korea, Italy, Germany and Belgium — and for many of them, their time living with the Rollins family was just the beginning of their experience here in the United States. Of the 12 students the Rollins have hosted, many of them have continued their studies in either an American high school or college. In fact, their very first student from South Korea returned to complete his studies just a stone’s throw away from the Rollins home, eventually graduating with his diploma from an American high school. He would go on to pursue his undergraduate degree at a university in Texas before returning to Korea for two years of compulsory military service. But even for the students that permanently returned to their home countries after departing the United States, David and Sherry continue to connect with each of them via Skype at least once a quarter. Some have even returned to Texas to visit the Rollins family many years after their exchange experience. Next year, David and Sherry also plan to visit their former German exchange student’s biological family in their hometown. These lifelong relationships with former students come as no surprise to David and Sherry, since the couple attests to forming very close bonds with each of their students. It’s these close bonds that make the inevitable culmination of each student’s stay in the Rollins home so bittersweet. Though the pair admits that being a host family for foreign teenagers can certainly be challenging, they insist that the experience is worth the emotional and logistical obstacles inherent to hosting. After all, from the moment they walk into the Rollins’ household, they are no longer strangers — they are part of the family. 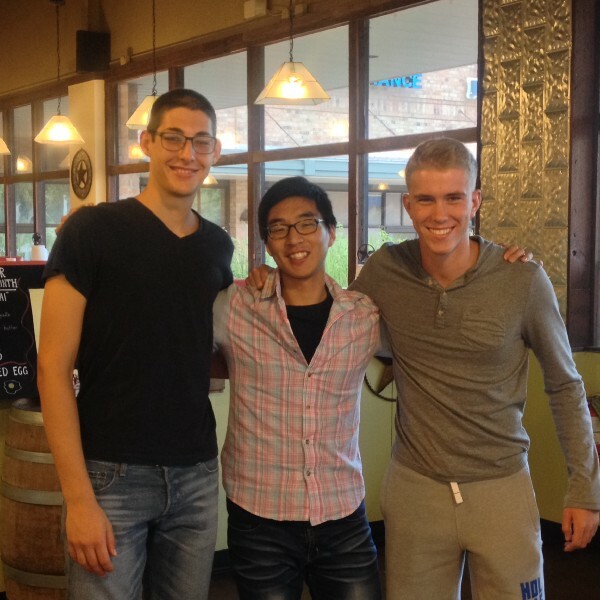 Two of the Rollins’ then-current students, Marco and John (left and right, respectively) with their former student, Sang (center) during a return visit to the United States. In the case of the Rollins family, becoming a part of the family isn’t just about spending time together or congregating around the dinner table. According to David, the real family bonding starts when their students learn to take on their own household responsibilities — or, more simply, when they’re tasked with their first set of chores. Of course, it’s not all chores with the Rollins. After picking up a new exchange student from the airport, the family doesn’t head straight home, but instead to their favorite local burger joint — a mom n’ pop shop called Moonie’s in Cedar Park. For many of their students, this is not only their first experience with authentic American cuisine but also the perfect introduction to the Rollins family way of life. Each of the Rollins’ exchange students accompanies them on family vacations, trips to run errands and even church service every Sunday — a tradition that is not about adopting the family’s religion, but entirely about understanding and truly appreciating the family’s values. All in all, both David and Sherry feel their approach to integrating a student into every aspect of their lifestyle is one of the reasons why they’ve had such positive experiences throughout their 12 years of hosting. It’s this crystal-clear understanding of what matters most to their family that helps David and Sherry choose the right students year after year. In fact, both David and Sherry make a concerted effort to begin looking for the right match sometimes as many as six months in advance! But for Sherry and David, hosting exchange students is nothing short of a calling — one that’s rooted in their faith as well as their personal beliefs. This year, the Rollins are enjoying a year focused solely on their granddaughter, a talented student-athlete who will soon begin ninth grade. Despite the year sabbatical, neither David nor Sherry are ready to end their tenure as one of ISE’s most prolific host families.